I have a problem. Before I get going, and just so you know, I realize this is probably not the biggest problem that anyone has ever faced. As a matter of fact, I happen to know that many of you have faced way bigger problems than this one. It’s not life or death or anything even close to that. But this problem is mine and I need some help with it. Now it’s not often that I ask my readers, or anyone else, for help. Ok, so come to think about it, I suppose I did ask for some help the other week when I was doing that big race. Of course that help wasn’t exactly for me, so it’s not really in the same category. And I admit that I haven’t actually done any cooking for about twenty years and I’ve been eating pretty well, which means I’m getting quite a bit of help with that. Though other people in the house like to eat too so that help isn’t only for me either, and anyway, we have long since stopped believing that a woman’s place is in the kitchen, haven’t we? Which brings me to my problem and the help that I need. Let me start by explaining that this problem of mine is not a new one since it started about twenty-five years ago. That’s when I moved into my house in one of those lovely, desirable and sought after older neighborhoods where you pay a rather hefty premium for the privilege of being able to “make it your own” which translates into spending gobs of money to ensure that you can run the microwave while drying your hair, should the need arise. Most of the time when you get one of these houses you sacrifice features we have now come to expect from our dwellings like granite counter tops, stainless steel appliances, ensuites, walk-in closets and, perhaps most importantly, attached garages. But to make up for all of those losses you do get big backyards with lots of trees. And therein lies the problem because when you have garages at the back of your house surrounded by towering pine trees laden with multitudes of pine cones, (might I add, as they should be) it is only natural to get something else. And that “something” is squirrels. Lots and lots of squirrels. And not just any squirrels but whole families of squirrels. More squirrels than you can shake a stick at. Now don’t get me wrong. I have nothing against squirrels. Especially ones that mind their own business and do what squirrels are supposed to do which is mostly run around looking kind of cute, maybe burying a peanut or two in the garden and, once in awhile, unfortunately for the squirrels, find themselves losers in what they thought would be a fun game of chicken with the neighbor’s Volvo. Oh yes, and when they make their nests in those previously spoken about trees which it seems to me nature put there for just that purpose. But when squirrels decide that, like me, they prefer to live inside rather than out, and subsequently make their home in a garage, most notably my garage, using the insulation from the hood of my car to pad that little nest of theirs (and you know how I feel about my car), well that’s when I have a problem. Hence the need for your help. You see, for the past few years I have been doing my best to try to encourage these little critters to do what nature intended them to do and that’s live anywhere but in my garage. Don’t get me wrong. Plenty of people have given me plenty of suggestions and I have tried them all. I’ve bought the thing you plug in that makes a high pitched sound that apparently all animals disdain, but I can hear it and I still go into my garage, and so do they. I’ve filled up cans with ammonia and placed them strategically around the garage only to discover that my friends (and I use that term lightly) have spent the evening playing a rousing game of “kick the can” with little regard to the contents. And I have liberally spread enough mothballs throughout the garage to ensure the safety of my entire cardi collection for the remainder of my days, and yet, there they are, each and every morning, looking down at me as I make my way to the office. Sometimes I think they even give me a little goodbye wave knowing they will have my garage to themselves for the rest of the day. At my wits end I have now, at the suggestion of one of my co-workers lest you’re thinking about pointing fingers, acquired a trap. Don’t get too excited. It’s a live trap designed simply to encourage the rodent (well that’s what they are) to enter, get caught, and be relocated to a more suitable, parklike environ, where they can live out the remainder of their lives frollicking among the leaves and trees and perhaps the odd coyote. But I’ve run into a glitch. There are people in my house who are not quite as shallow as I. They think that this little plan of mine is akin to house wrecking and that breaking up the family is simply unthinkable. How, they ask, can I tear these children from the arms of their Mother? How, they ask, can I be so shallow? So here we are at a standstill and this is where I need your help. Surely someone out there has a surefire way, a tried and true method to rid my garage of these guests who have long ago outlived their welcome. That’s it in a nutshell. 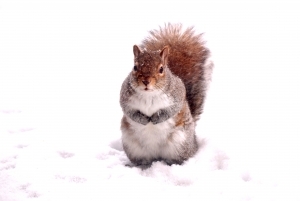 We need your help before we all go squirrely. Adventure! From now on that’s what I’m going to call it too! I’d send Meiko over but she only likes mice! I park on the street as I long ago gave up my garage to the sparrows. They think it is a very large Bird House and attack anything that tries to enter, especially when they are having babies. Maybe I can dress them up as mice and she’ll never know the difference. I had to trap a squirrel that got into our basement, and many others that took a liking to our property in Invermere. The live trap ought to work, and it is just a matter of time before you get all the pesky varmints and then you can reunite the family somewhere far away from your garage. It may take a while, but a little separation anxiety within the squirrel family might actually work in your favour! They’ll be looking forward to getting into the cage in order to get reunited with their loved ones. I also accidentally “caught” one in a large pail full of water that we had left outside to water the garden. Apparently they cannot swim in circles forever. And just in case you were curious … dead squirrels do float. Float you say. Good to know just in case we ever run out of apples at the block party. Did I mention they are eating the insulation in my car? So, here’s something to consider: if you evict them from your garage, will they find their way into your house? They’re resourceful little %&*#s, um, rodents. I tolerate the small inconvenience in the garage as a way of keeping them forever from my attic. Let’s see. Car/House Car/House. I *really* like my car! 1) Thanks so much for taking the time to read and comment on my blog. I appreciate that so much! Hope to see you stop by again.